Buzz Kanter's 1929 JDH. 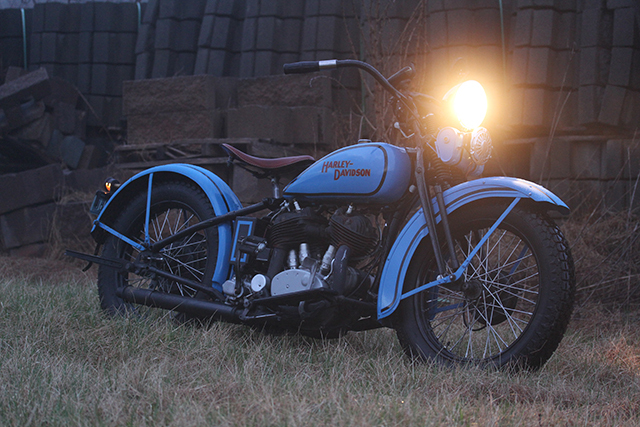 Photo by American Iron Magazine. 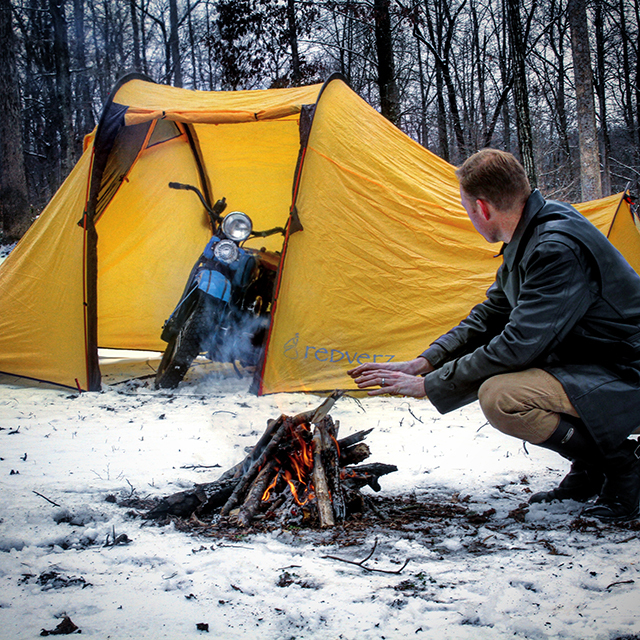 Nowadays the thought of riding a motorcycle in the winter months has almost become completely unheard of, especially among vintage riders. Most of us are lucky enough to have other forms of transportation and can safely leave our motorcycles in a warm garage all winter. This certainly wasn't always the case and a quick web search will yield hundreds of old photos of vintage motorcycles being ridden in all sorts of inclement weather. So for those that want to keep riding all year long, our old motorcycles are definitely up to the challenge with the proper preparation. Here's a few things to consider this fall to make sure your vintage machine is ready to hit the snow and ice this winter. Antique motorcycles already suffer from poor braking, so riding in wet conditions caused by snow or slush does nothing to improve their performance. Unfortunately, checking your braking system can be a bit of a hassle since it usually requires removing the wheel to see what's going on inside the brake drum. 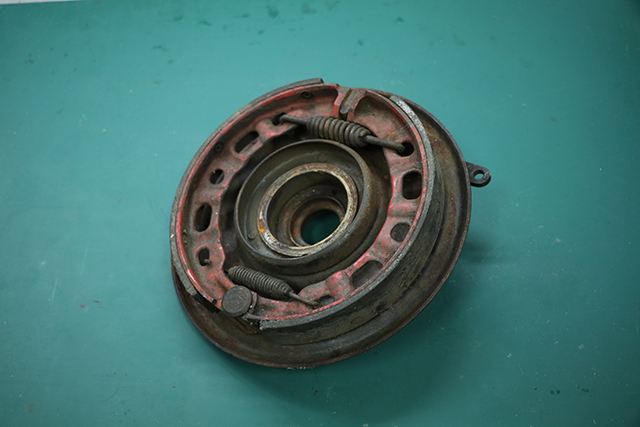 Check your brake shoes for even wear and replace or reshape them as necessary. 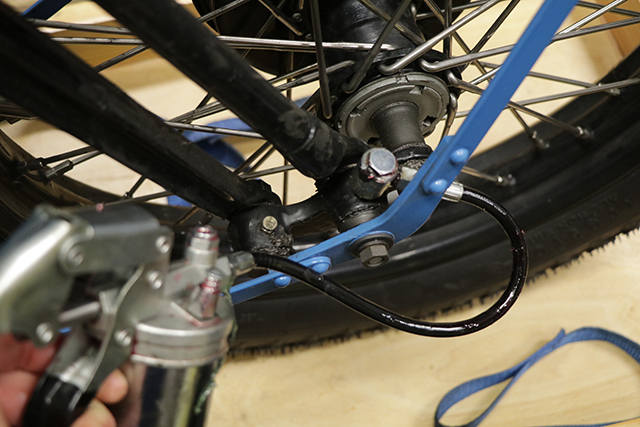 Also make sure to properly adjust and lubricate any linkages/cables to get as much slop out of the system as possible. While adjusting your linkages, keep an eye out for any excessive wear to bushings, clevis' and cotter pins. Once you get the brake apart, check the shoes for even wear and overall thickness. If you are going to be riding in really extreme conditions, its probably worth considering mounting a set of studded tires on your motorcycle. Most US States permit their use but you should verify make sure that your state is one of them. Tire studs can be installed in most tires with just the use of an cordless drill and a couple hours of time. 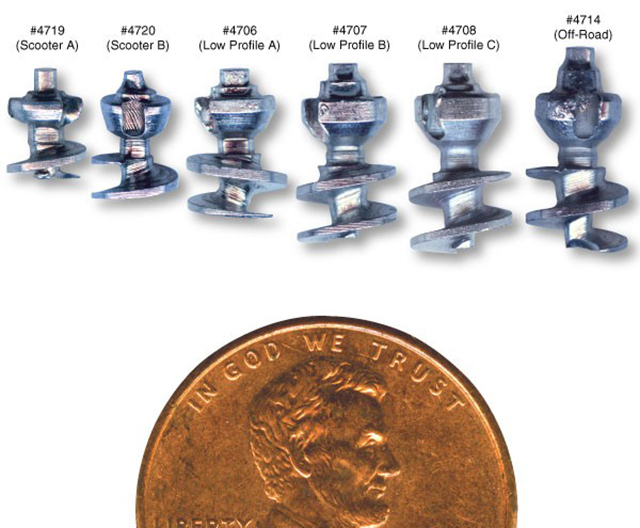 Tire studs come in a variety of sizes, make sure to get the right length so you don't damage your tires. The daylight hours are considerably shorter in winter and if you are going to ride you can be sure you are going to end up having to do so at night. 6 volt electronics don't always make for the brightest lights, but luckily with the advent of LED technology there are some new options for low power lighting that makes riding at night tolerable. Also keep in mind that it just as important that other drivers see you, so upgrading your tail light to a brighter LED bulb is also a good idea. The warm glow of a 6 volt headlight might be fine in town, but on a dark winter's night the added brightness of an LED bulb makes a big difference. Riding for hours in wet conditions can be detrimental to even the most basic electrical system. Make sure all your connections are tight and add a little dielectric grease to your connections to help keep the moisture out. A little dielectric grease on your electrical connections will help keep them dry and corrosion free. A major issue with riding in the winter is the amount of road salt that will work it's way into every part of your motorcycle. 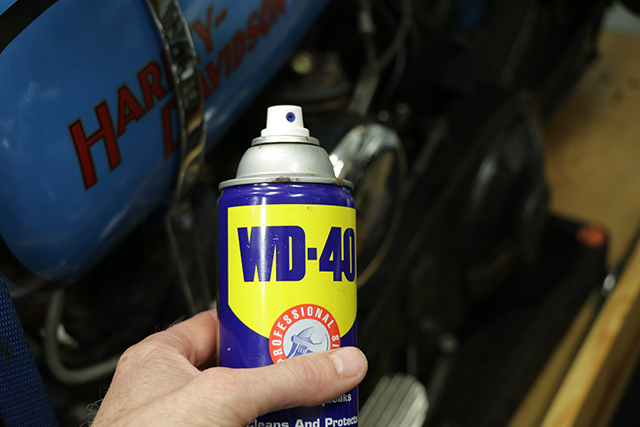 Luckily my old motorcycles have a nice protective layer of oil on most of their parts, but for those rare clean areas a liberal coating of WD-40 helps to fight off the corrosion. I recommend a thorough rinse after each ride on salty roads followed by wiping down and/or spraying with WD-40. The "WD" stands for "Water Displacement", use liberally on metal parts after a thorough rinse. Motorcycle batteries are significantly smaller than the ones on cars so they are more likely to die when left out in cold weather. However most antique engines do not need that much power to start (especially if your motorcycle is kick only) which means a small jump starter will work wonders. 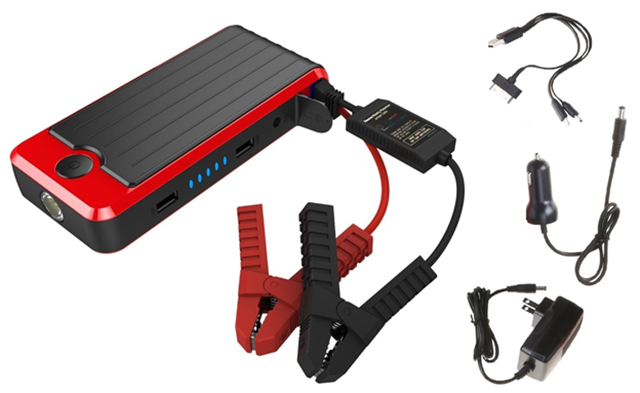 To be more specific, there is an entire range of jump starters / power banks that you can use to power your phone, your laptop and in an emergency jump start a car. You may or may not believe that they are strong enough to jump start a car, but they have certainly more than enough power to jump start a motorcycle, so have one ready. Reviews Academy recommends the PowerAll model, but honestly, any portable jump starter will do. Just make sure you get a jump starter with the appropriate voltage for you motorcycle or adjust the voltage with an inline voltage reducer. A small jump starter will easily fit in your saddlebag, just make sure to charge it first. The best way to keep salt, water, sand, etc out of your external moving parts is with the application of a good quality grease. Currently I am using a marine grade grease from Mercury on my 1933 VL which is heavy weight and resistant to salt water. 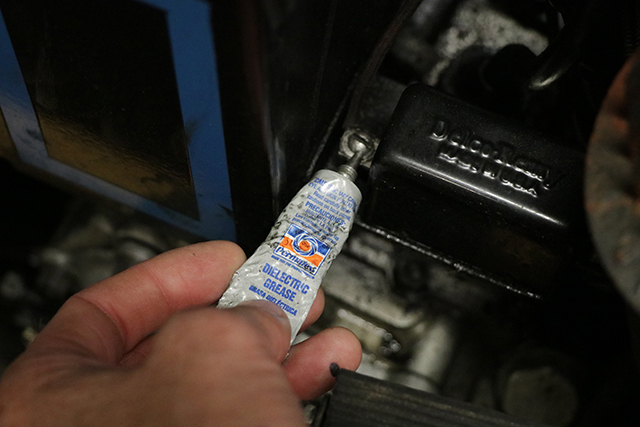 There are over 20 grease fittings on a VL, so make sure to take your time and hit every one with some grease. A high quality grease will help cut down on corrosion and keep your moving parts working smoothly.